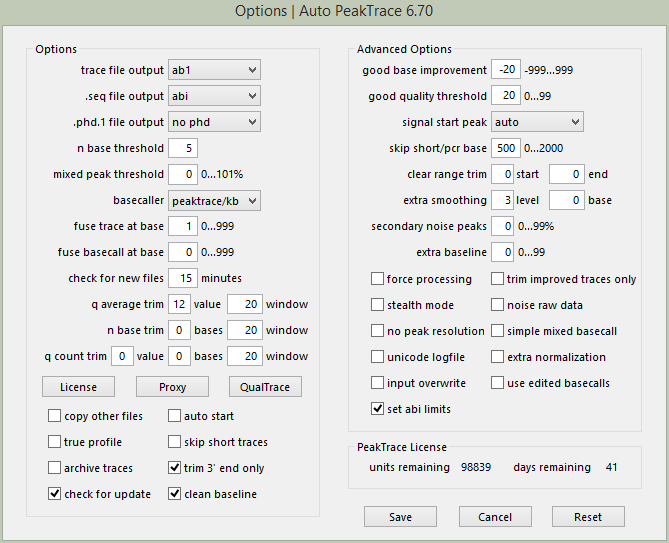 We have released Auto PeakTrace 6.90 and PeakTrace 6.90 for both Linux and Windows. This release contains a major overhaul of all the algorithms used in PeakTrace with the aim to improve low quality reads. This has not been a small or easy project, but we hope the improvements make the effort worthwhile as PeakTrace can now rescue many more marginal traces. New Feature. Support for ThermoFisher SeqStudio™ Sequencer. New Feature. Fuse trace at base default is now 0. Improved basecalling especially of low quality traces. Improved detection of PCR products. Improved PeakTrace processing and basecalling through “dye blobs” peaks. The signal start peak auto setting now sets the start peak to the value closest to the model expected value. The automatic fuse trace at base or fuse basecalling at base on traces with large dye blobs peaks can be turned off by setting fuse basecall to -1. Unit data and build date can be written to a text file with the -rf options. Support temporary removed for the following machines and run types. These run conditions are rarely used, but support will be returned in the next major update. Update of the CodeMeter runtime to 6.60a. Due to limitations of the CodeMeter runtime support on Linux this update is only compatible with REHL7/CentOS7. Many other bug fixes and internal improvements. 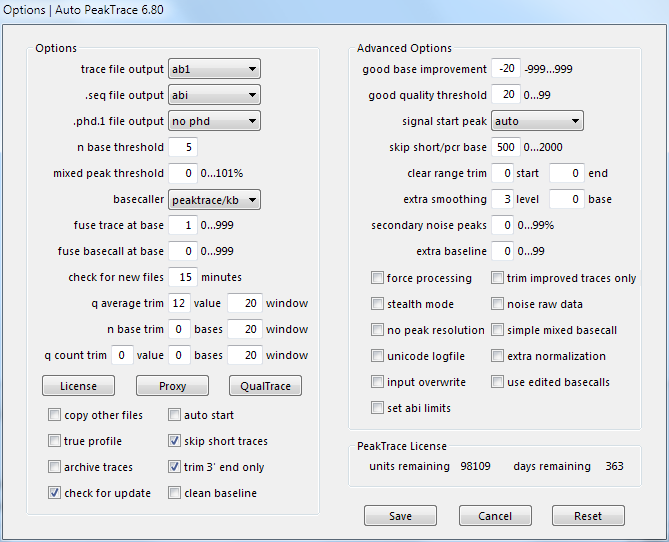 Auto PeakTrace 6.90 can be downloaded from the PeakTrace:Box Downloads page. If you do not know the password to access the PeakTrace:Box Downloads page please contact us @support@nucleics.com or contact your local supplier for the update. The command line PeakTrace 6.90 version for Windows and Linux is also available on the PeakTrace:Box Downloads page. This update is highly recommended for all users of the Auto PeakTrace or PeakTrace 6.82 and earlier. 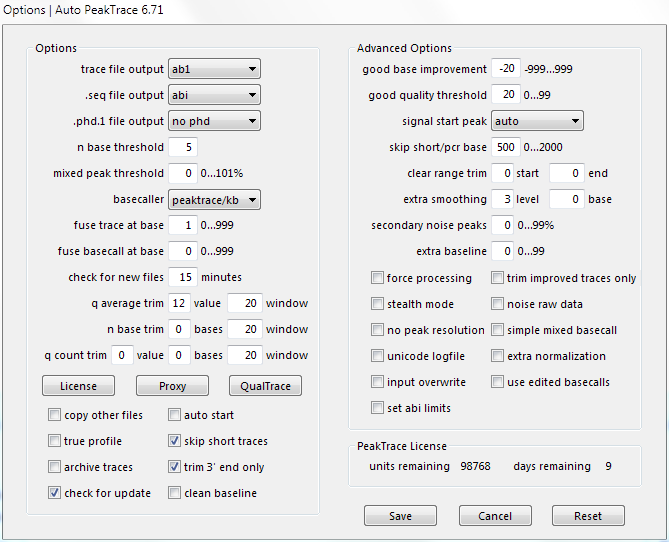 We have released Auto PeakTrace 6.82 and PeakTrace 6.82 for Linux and Windows. This release has large number of changes and improvements that normally would mean a major 0.1 release, but since the new features are of limited interest for most users we have kept it as as a minor 0.01 release. New feature. Output both peaktrace processed and no peak resolution (raw data) .ab1 trace files at the same time. New feature. Ultra-aggressive clean baseline cleaning when mixed peak threshold is set to 102. Improvement to basecalling include G-peak dropouts. Bug fix that prevented the input and output folders being updated from the Auto PeakTrace command line. Version, build date, license code and license time and unit values now accessible from the Auto PeakTrace command line. Errors and processing progress when using Auto PeakTrace from the command line are now output to the command line window. Auto PeakTrace 6 now reports the time until license expiry. The avoids the issue when a license update is applied a period of time after it is generated reporting an incorrect license length. Auto PeakTrace 6 is now valid (non-obsolete) for approximately 24 months rather than 18 months. Update of the CodeMeter runtime to version 6.60. 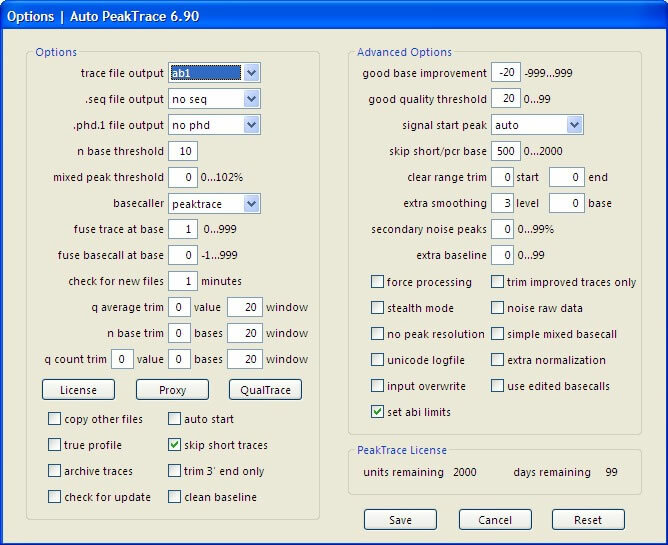 Auto PeakTrace 6.82 can be downloaded from the PeakTrace:Box Downloads page. If you do not know the password to access the PeakTrace:Box Downloads page please contact us @support@nucleics.com or contact your local supplier for the update. The command line PeakTrace 6.82 version for Windows and Linux is also available on the PeakTrace:Box Downloads page. This update is recommended for all users of the Auto PeakTrace or PeakTrace 6.81 and earlier. Improved basecalling and detection of low quality mixed peak traces. Bug fix for trace trimming modules. With traces that are not improved, only soft trimming (abi limits) is applied. If the abi/kb basecaller is selected and set abi limits is unchecked then then the trace will still be hard trimmed. This update is an optional update for all users of the Auto PeakTrace or PeakTrace 6.80. For user of Auto PeakTrace the changes are automatically applied on the server end. New Feature. Total traces processed and success rate shown. New Feature. Auto PeakTrace RP 6 can be used as a command line program. More accurate estimated time for trace processing completion. The major change of this release is that Auto PeakTrace RP 6.80 can now be used from the command line. This allows the easy integration of Auto PeakTrace RP 6.80 into various LIMS scripts. If Auto PeakTrace RP 6.80 is used from the command line with no options it will use the settings (including the input and output directories) saved from the last use of Auto PeakTrace RP 6. The saved settings can be overwritten by the use of command line switches. If no switch value is provided on the command line then value in the save setting file will be used. Settings that are changed via the command line update the setting file for future runs of Auto PeakTrace RP 6. 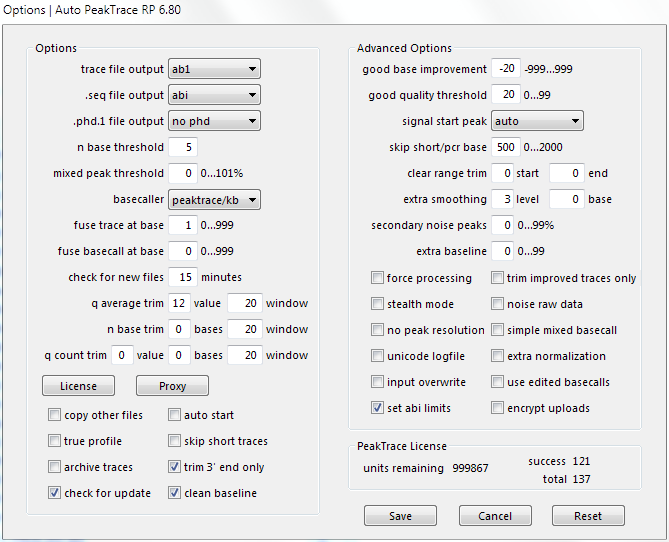 Auto PeakTrace RP 6.70 for Windows and (MacOS X will be released later) and can be downloaded from the PeakTrace RP downloads page. This release is also available via the automatic update feature within Auto PeakTrace RP if you are currently using a recent version. Improved processing of weak traces. Improvement to q count trim and n base trim modules. Fix of a bug that resulted in some good peaks being called as N.
This update is a recommended update for all users of the PeakTrace:Box System. For user of Auto PeakTrace RP all changes are on the server side and so you have been automatically updated. 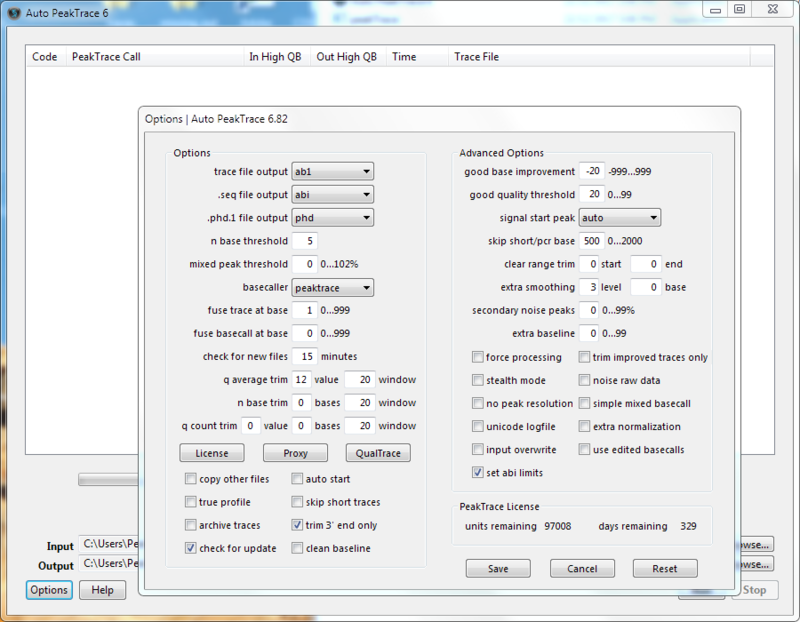 Auto PeakTrace 6.70 Options Window. Improved support for NanoPOP™-7 polymer traces. Force processing now makes PeakTrace basecall the low quality data regions. Improved support for more non-standard run conditions and voltages. Trace Reports now hide the use of PeakTrace or QualTrace when stealth mode used. Bug fixes and enhancements of trace processing. This update is a recommended update for all users of the PeakTrace:Box System. Improved support for NanoPOP™-7 polymer and BrilliantDye™1.1 chemistry traces. Force processing makes PeakTrace basecall the low quality data regions. 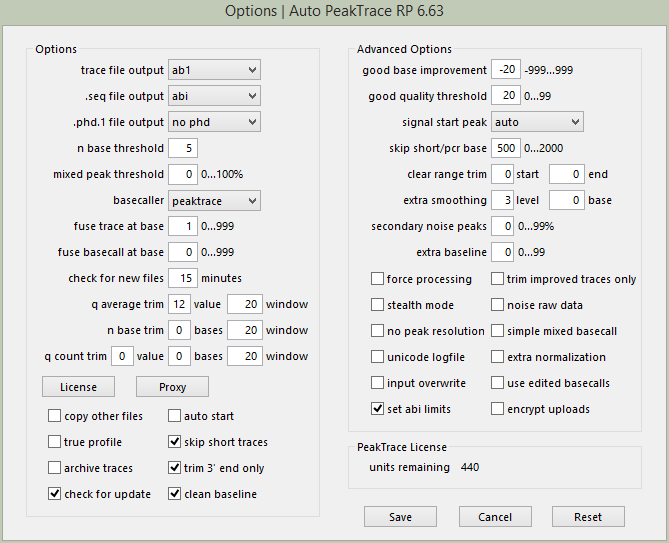 Auto PeakTrace RP 6.70 for Windows and MacOS X can be downloaded from the PeakTrace RP downloads page. This release is also available via the automatic update feature within Auto PeakTrace RP if you are currently using a recent version. Improved clean baseline and extra baseline modules. Improved comparison between KB and PeakTrace basecalls. Improved processing of low resolution traces. Bug fix for picket fence output. Bug fix preventing reltrace output when using hard trim. This update is a recommended update for all current users of the PeakTrace:Box System. 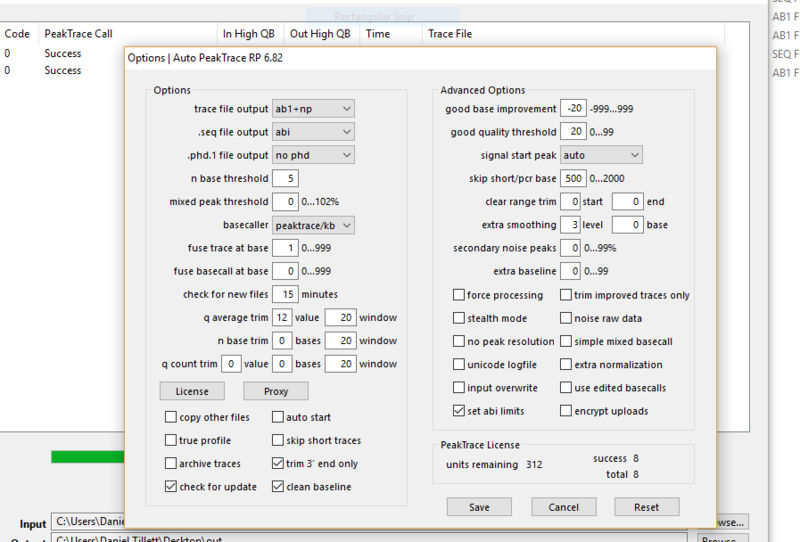 We have released another small update for Auto PeakTrace and PeakTrace (6.62). This adds improved support for the BrilliantDye™ chemistry when run on the ABI 3730 with 50cm arrays and the standard 8.5.kV run voltage. It also include improve identification of mixed traces during processing. This change has been included on the server side for Auto PeakTrace RP so there is no need to update for RP users. This update is a optional update for all current users of the PeakTrace:Box System.